I'm so proud of my hubby! 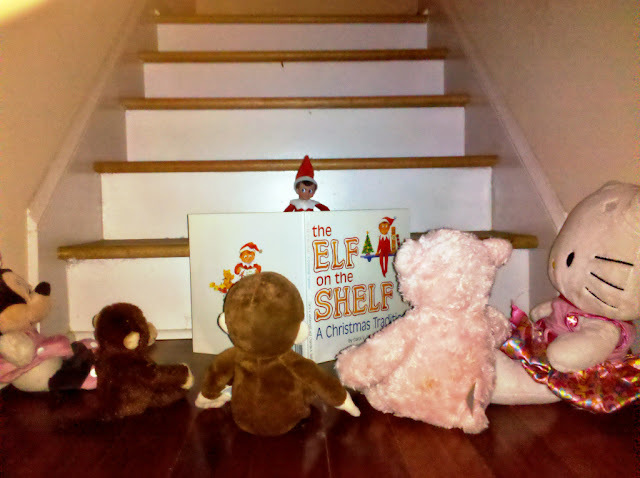 While I'm away he sent me pictures of what the Elf has been doing: this morning Ben sent me pics of the Elf reading his story to the other stuffed animals on the stairs...it is so CUTE! If you haven't read the Elf on the Shelf, it is a really cute story that explains that the Elf uses Santa's magic that allows him to fly back to the North Pole every night and tell Santa whether little boys and girls have been naughty or nice and the reason why we aren't allowed to touch him. The story flows very nicely, rhymes and has really good illustrations that can easily engage the kids by trying to find the Elf in the pictures. This is a story I've read over and over and even though I have it almost memorized, I still like reading it. While I'm away at work this week, I miss seeing the kids faces and the escapades the Elf is up to: I can't wait to see the pictures my hubby takes tomorrow!